One of the main challenges of any digital nomad is staying healthy on the road: because good health starts in our gut, here are some ideas for healthy Airbnb cooking, which can be difficult in shared kitchens. In a previous article I discussed Airbnb etiquette and sharing a kitchen can make or break the relationship between host and guest. Smelly cooking can create tension because smells can linger after a guest’s departure, making it difficult for a host to prepare a room for the next guest (see discussion in the Airbnb community forum). Many Airbnb places do not offer access to the kitchen for this reason. Another factor to consider when sharing a kitchen is food preparation and cooking times: if you can manage to get everything done in less than half an hour you are more likely to get a good review as a guest. Also, the less time you spend cooking, the more productive your day will be. It goes without saying but washing up is a must after you cook a meal. Finally, before you go to the local market or supermarket and stock up, check what kind of equipment and utensils the kitchen has. For example: is there a can opener? The last thing you need is buying a lot of tinned food only to find out you can’t open it. It happened to me, but thankfully I found a hammer and a screwdriver so I hammered all around the tin can lid to open it (with much effort!). As long as there is at least one pot and one frying pan, some cutlery and maybe a wooden spoon, you should be able to make basic but nutritious meals. While this topic has been covered extensively (see, for example, this article by the National Geographic), if you are a digital nomad working extremely long hours you need a strategy to stay healthy and productive. It can be a good idea to talk to a nutritionist before going away or even while travelling – you can get a consultation online if you can’t find someone locally. A nutritionist can advise you on supplements you may need to keep healthy (plus, there are so many books available, too). Generally speaking, a good multivitamin can complement your diet. Don’t underestimate the importance of a healthy gut, because that’s where our immune system is and where we absorb all nutrients. A probiotic supplement can help maintain a good immunity. Even something mundane like a cold can slow you down when we are working, and lost productivity can affect your earnings. While it’s tempting to wind down with a drink after work or snack on chocolate or sugary snacks during the day to raise energy levels, sugar (in alcohol, food and drinks) is an energy-zapper and is best avoided or kept to a minimum. Instead, opt for plenty of filtered water, fresh fruit and vegetables and, if available, bottled fruit and vegetable juice that you can drink when travelling. Schedule at least twenty minutes of exercise each day, even if it’s just a simple workout in your room. You can find some great fitness video tutorials such as the ones from The Body Coach. A final thought: have you considered learning about foraging? It combines exercise (walking outdoors) with food sourcing and it’s free. There are so many vegetables you can pick as long as you are in green areas away from traffic. These recipes are simple suggestions to use fresh vegetables and a protein source to make meals that shouldn’t take more than twenty minutes to prepare. They are examples of how to use some basic ingredients and combine them to make different types of meals. You can also add more vegetables such as spinach and broccoli, and as many condiments as you like, for example chilli sauce. 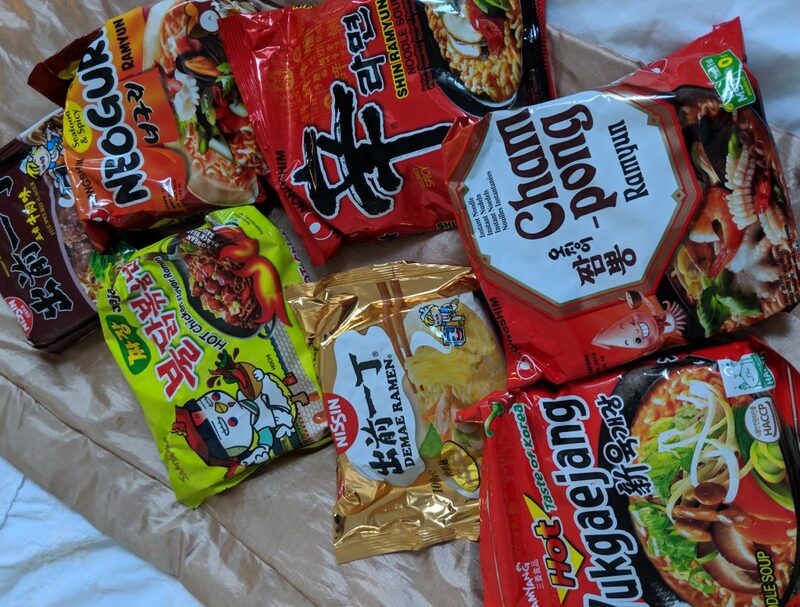 A useful hack that I learned as a digital nomad is to add plenty of chopped fresh vegetables to instant ramen noodles soup packs. Instant ramen soup sachets come with dried noodles, dried vegetables and/or protein such as chicken, beef, pork, tofu or seaweed, and a dry broth base. They take 3-4 minutes to cook and if you add chopped spring onion, asparagus, mushrooms, pak choi, broccoli or other vegetables of your choice you can get a complete meal. The downside of instant ramen soup is the high salt content so it’s best not to have it every day. Warm salads are quick and easy to prepare, and are more satisfying than cold salad. In this recipe I used foraged mushrooms but of course you can use mushrooms from the supermarket or other vegetables of your choice. 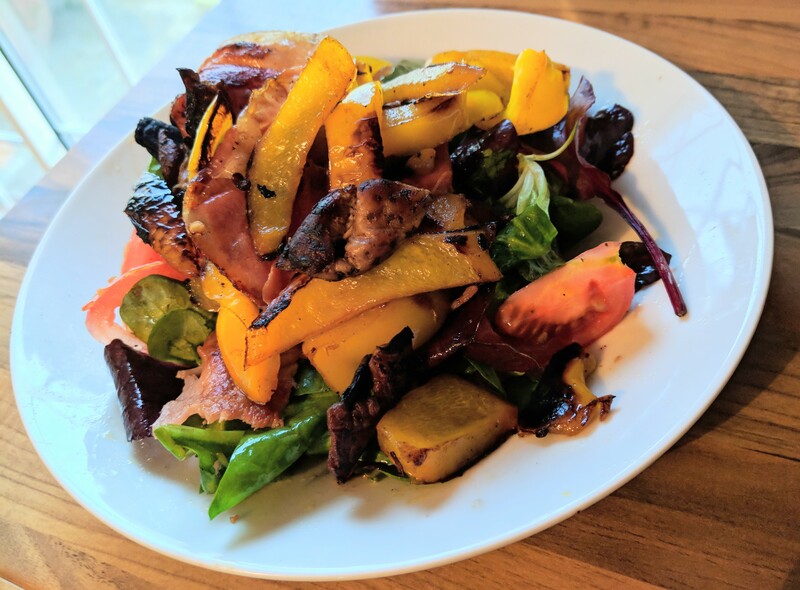 Simply combine some salad leaves and fresh tomatoes with cooked bacon, peppers and mushrooms. Season with olive oil, balsamic vinegar and a pinch of salt. Slice a chicken breast into thin strips, because they cook quickly, and pan-fry the strips with a little oil (vegetable or olive oil). Cut a red or yellow pepper into thin strips, too, and add it to the pan. It should take 5-10 minutes to cook through. Season with salt and any spices you may have – paprika works really well or a fajita/cajun spice mix. Take a tortilla wrap, place a couple of lettuce leaves on it, a few slices of fresh tomato, the chicken and pepper. If you like, add some mayonnaise or chilli sauce. 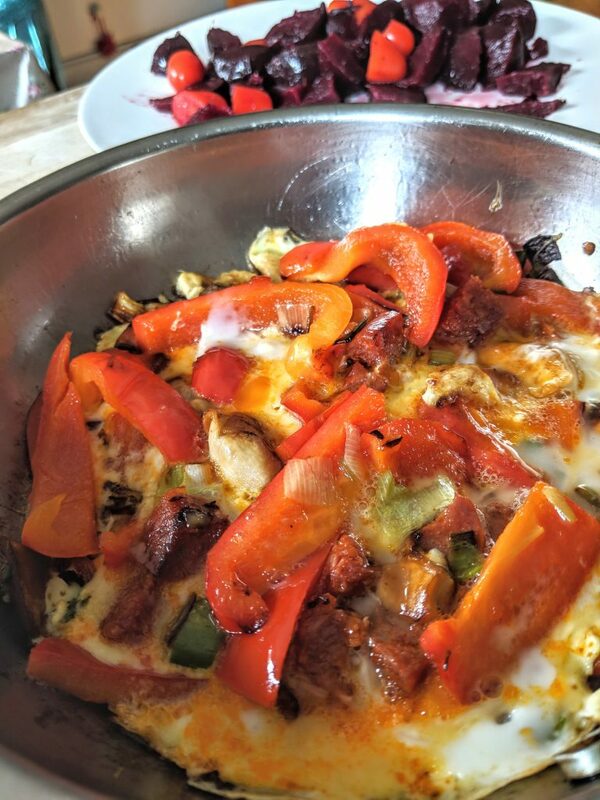 Similarly to the previous recipes, you can use peppers and mushrooms to make a Spanish omelette or tortilla. In a frying pan, heat some olive oil and cook the chorizo cut into cubes, sliced peppers, mushrooms and spring onions (scallions) for about 5 minutes. In a bowl, crack two eggs and whisk with a fork, then pour into the pan and cook for about 3 minutes or until the eggs is no longer runny.